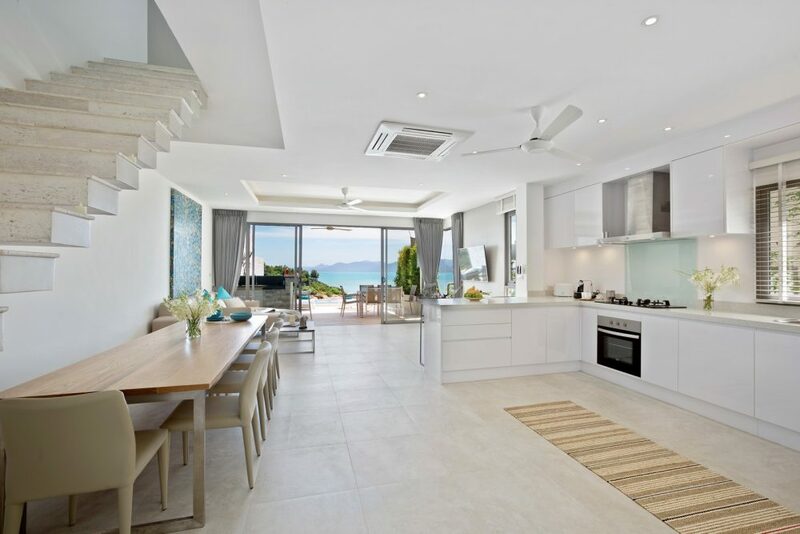 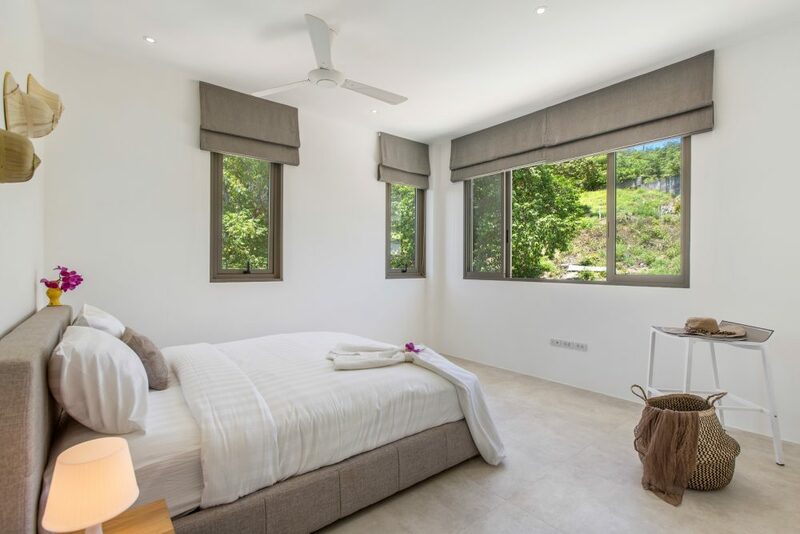 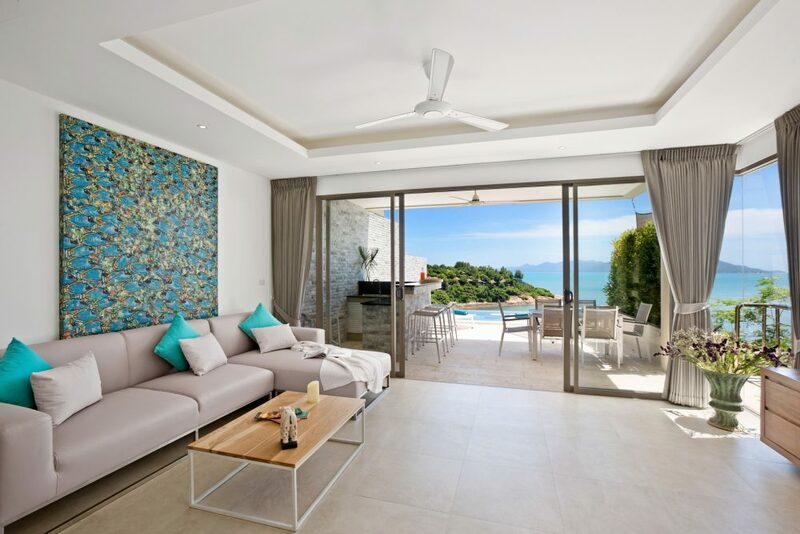 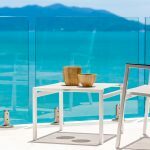 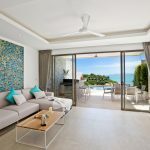 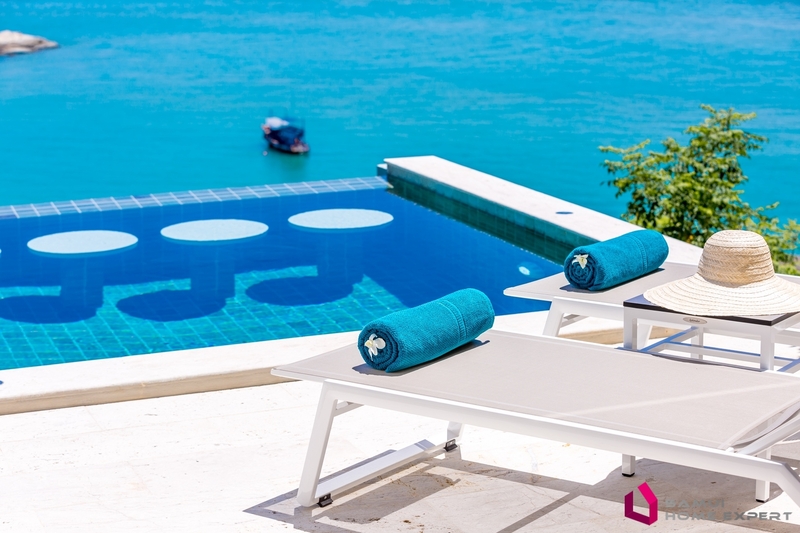 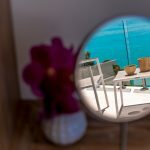 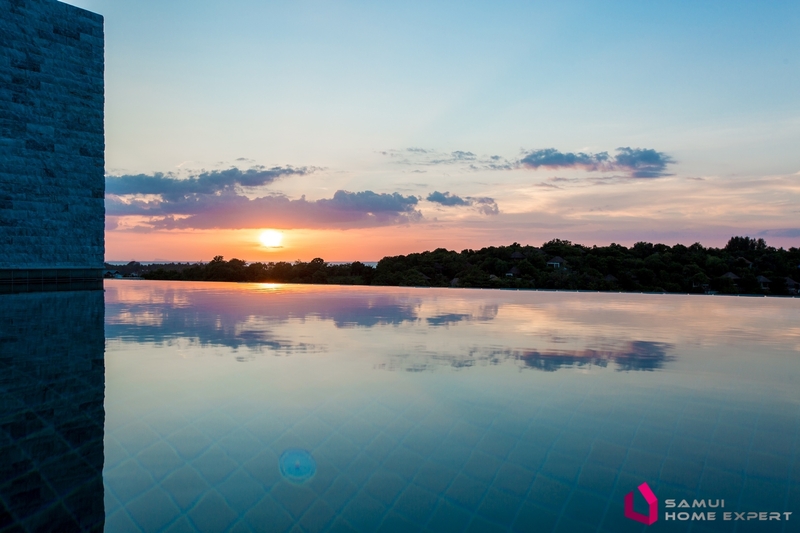 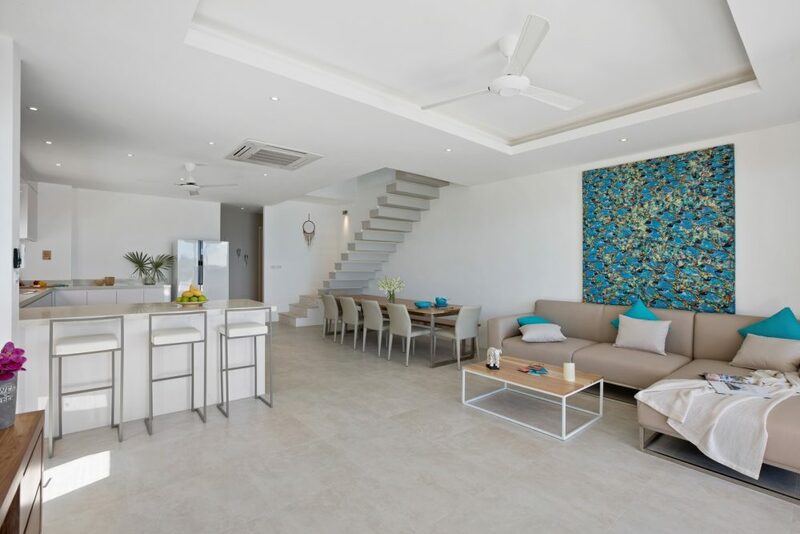 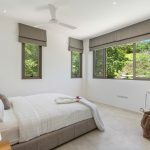 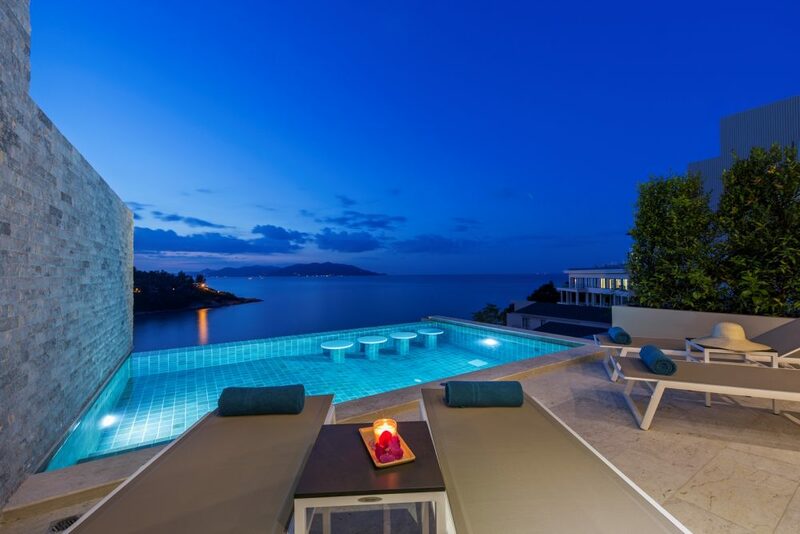 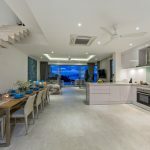 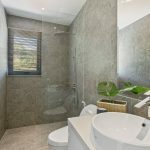 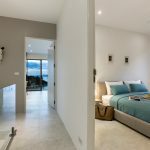 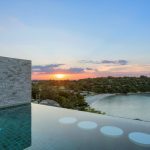 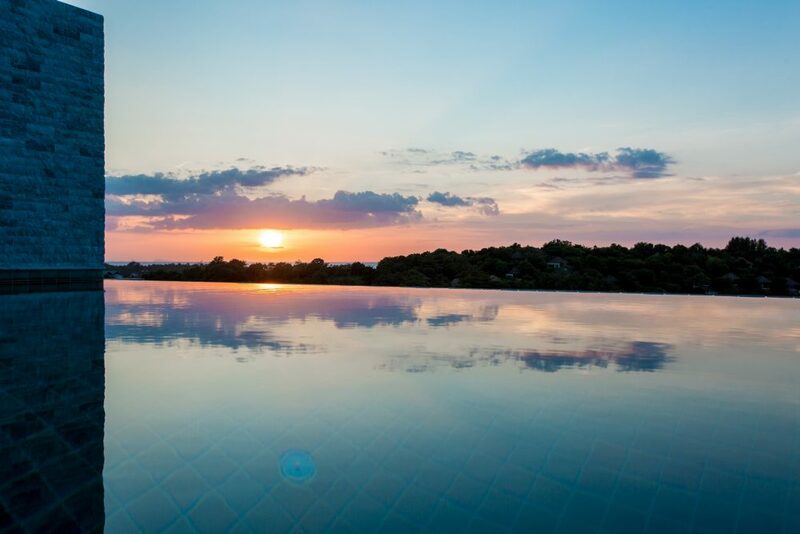 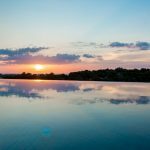 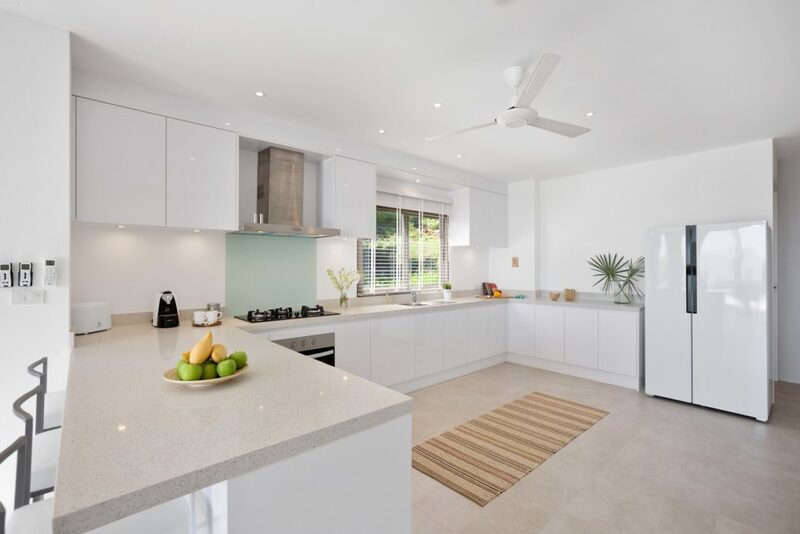 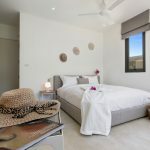 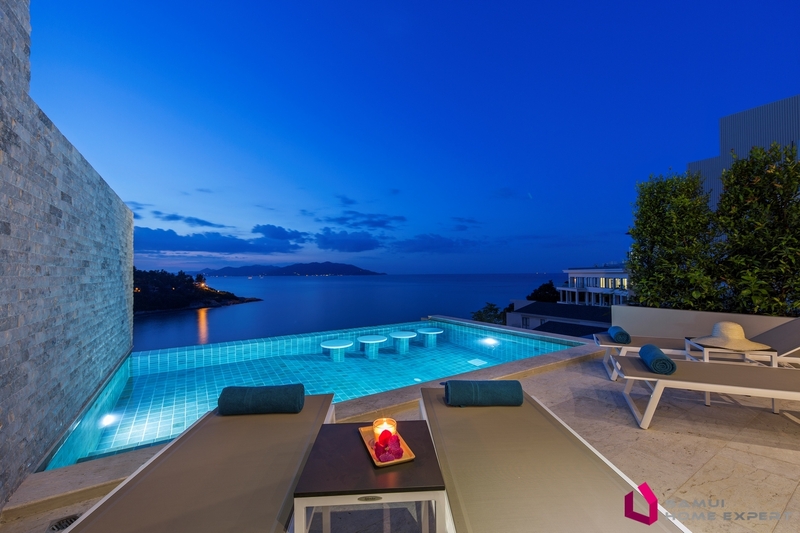 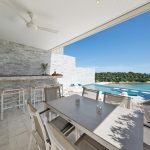 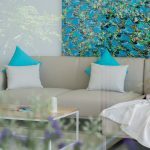 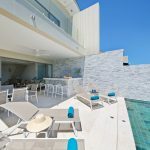 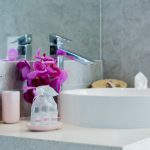 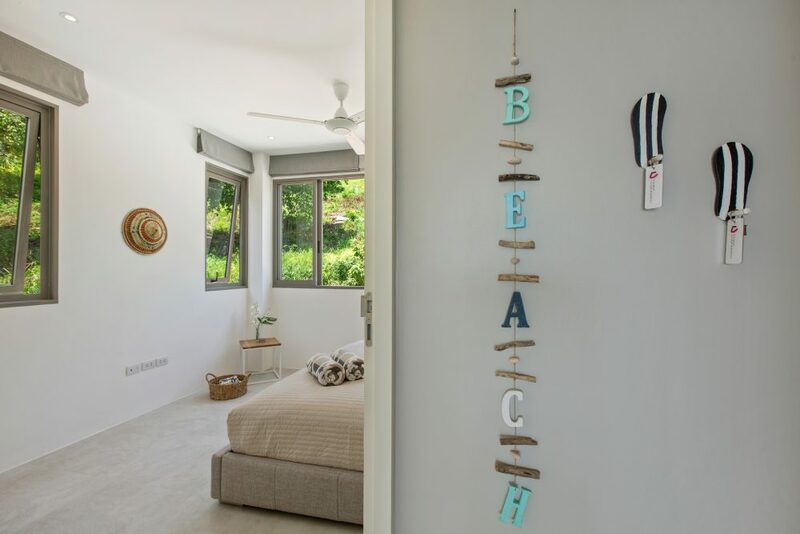 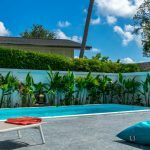 This villa undoubtedly boasts one of the most beautiful views of the island and an exceptional location just a short walk from a white sandy beach with crystal clear turquoise water, worthy of a postcard. 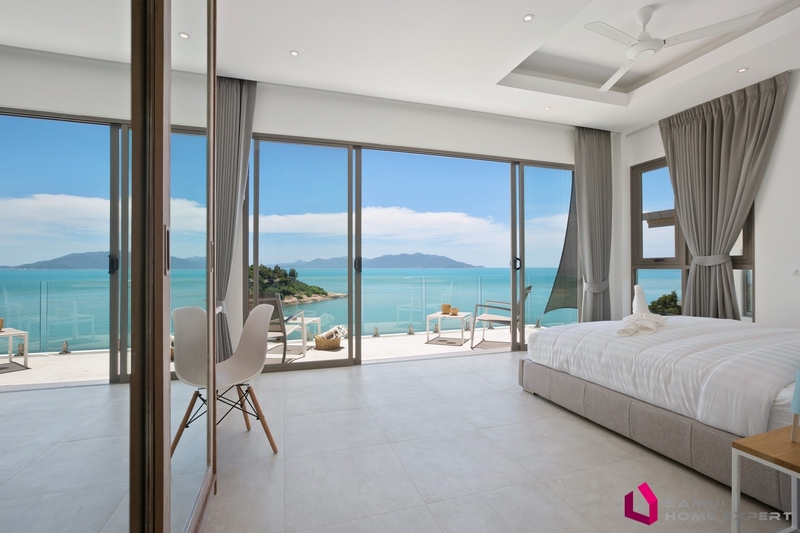 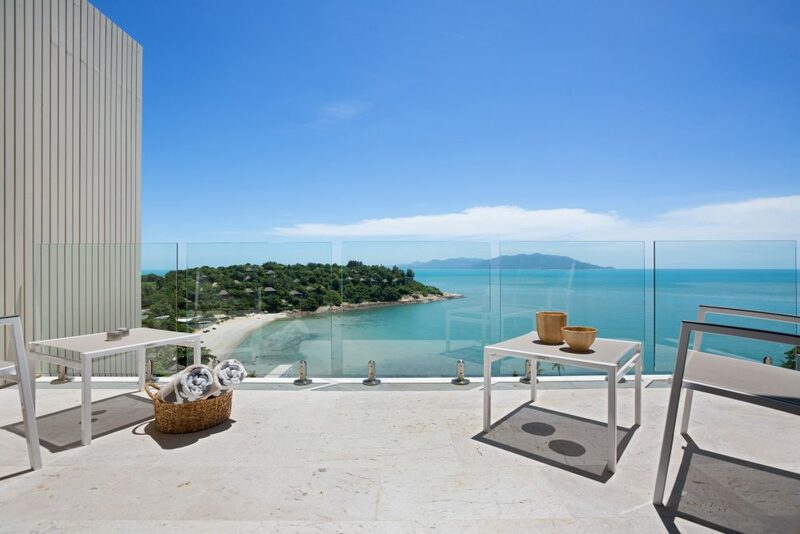 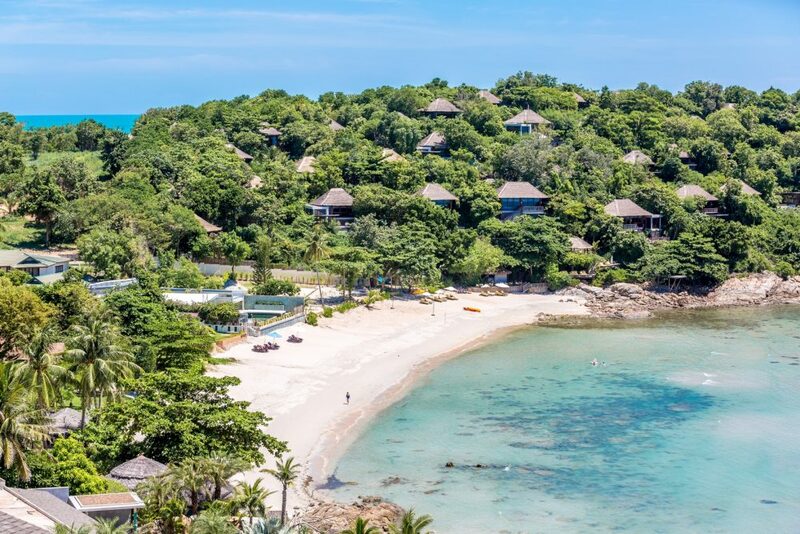 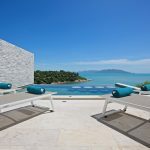 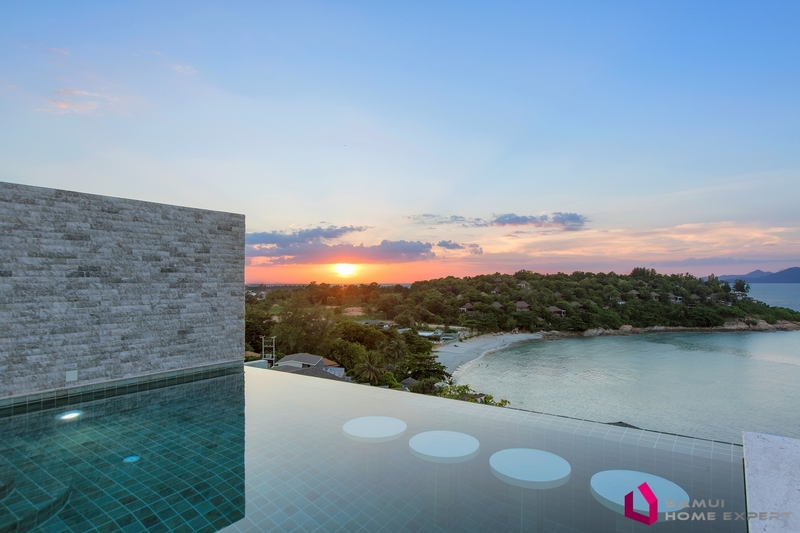 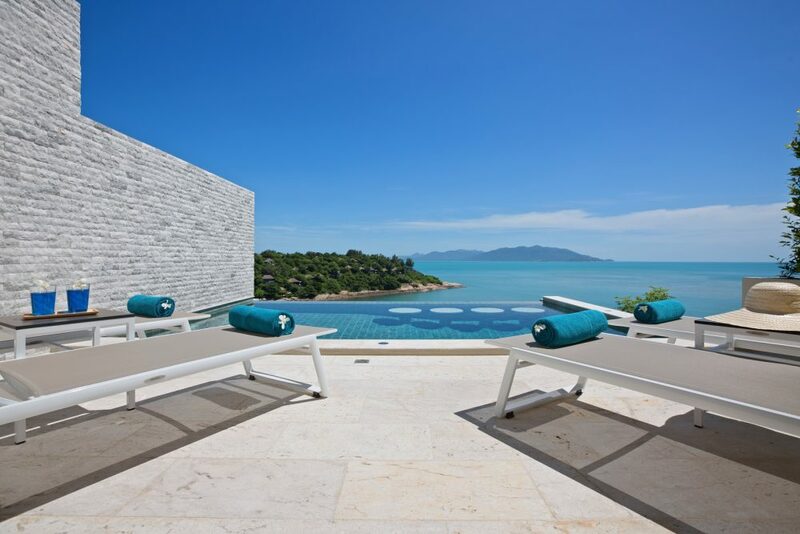 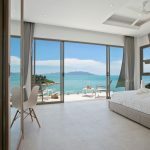 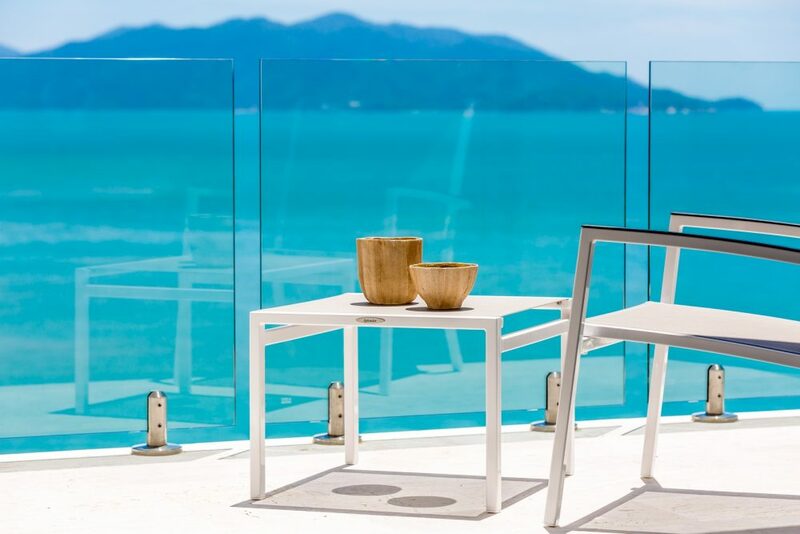 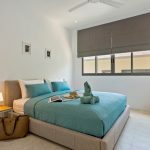 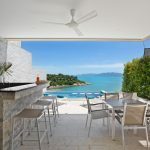 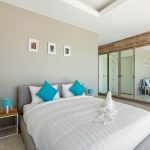 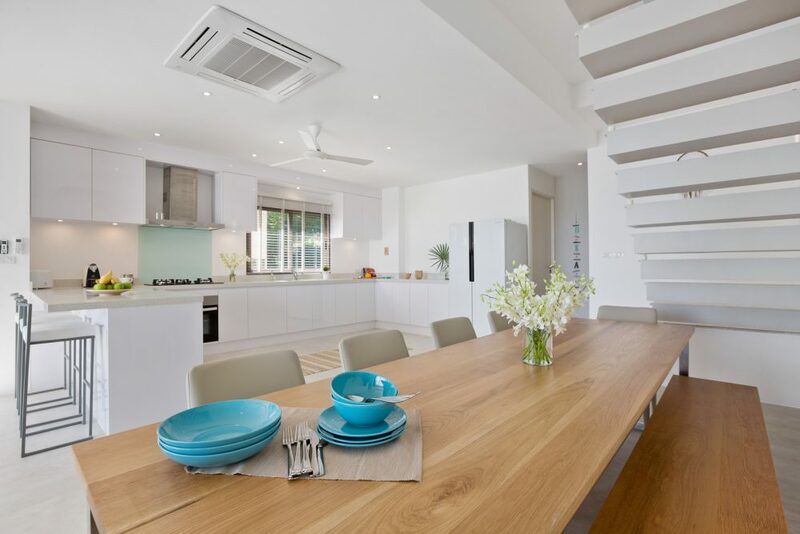 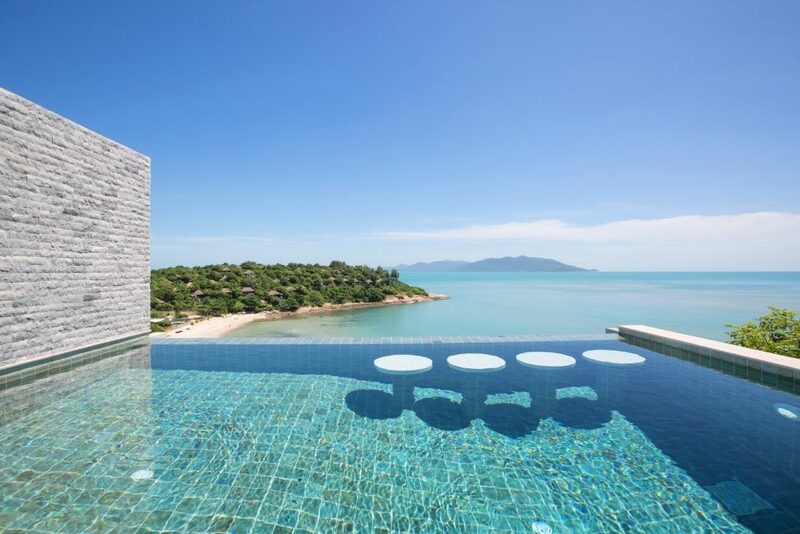 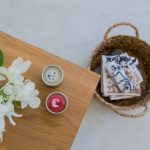 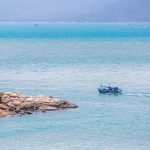 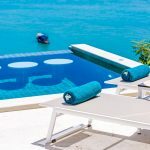 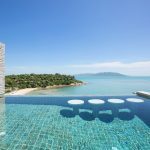 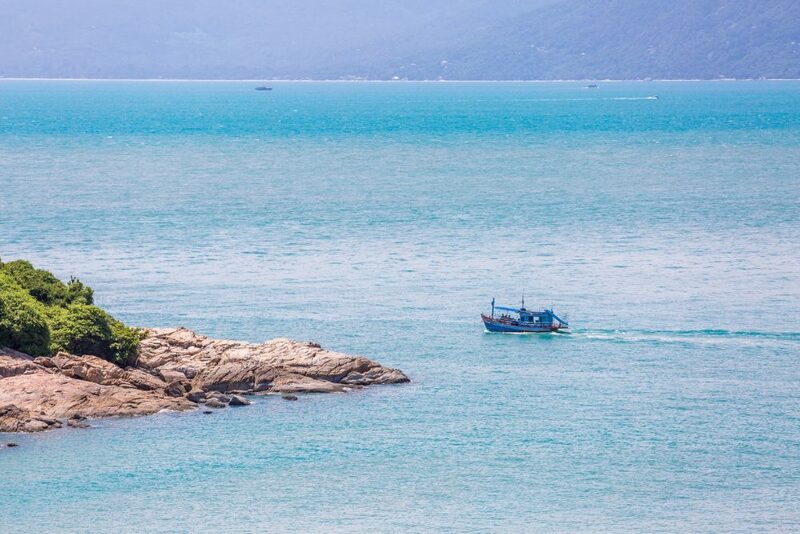 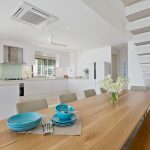 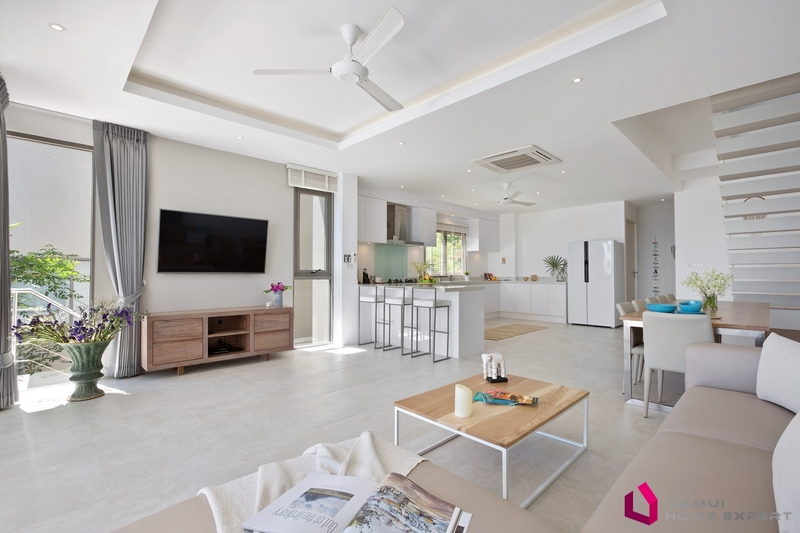 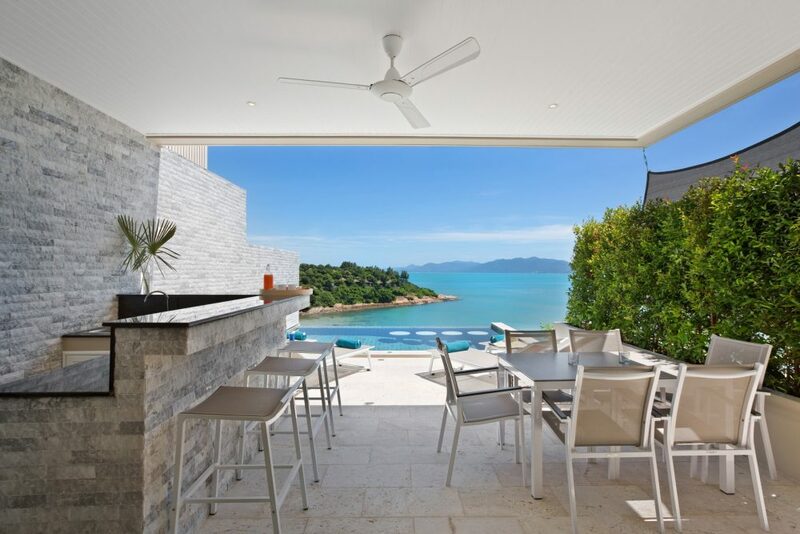 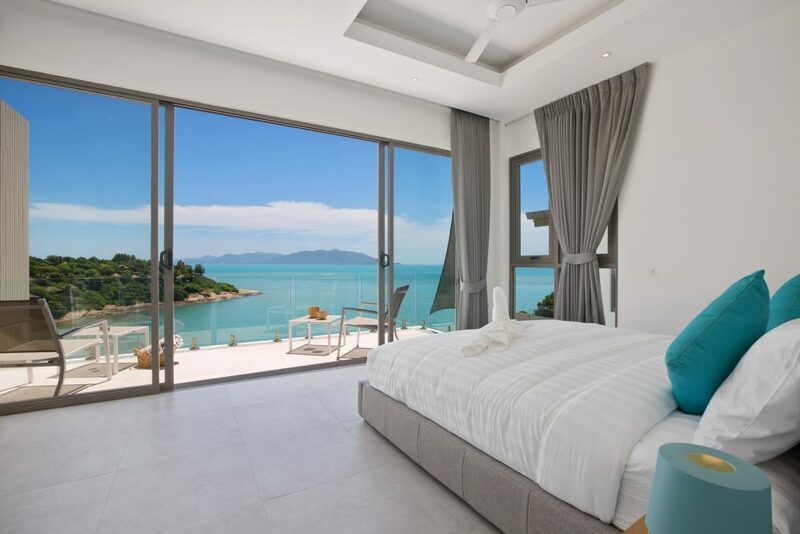 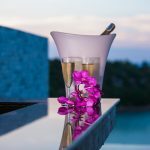 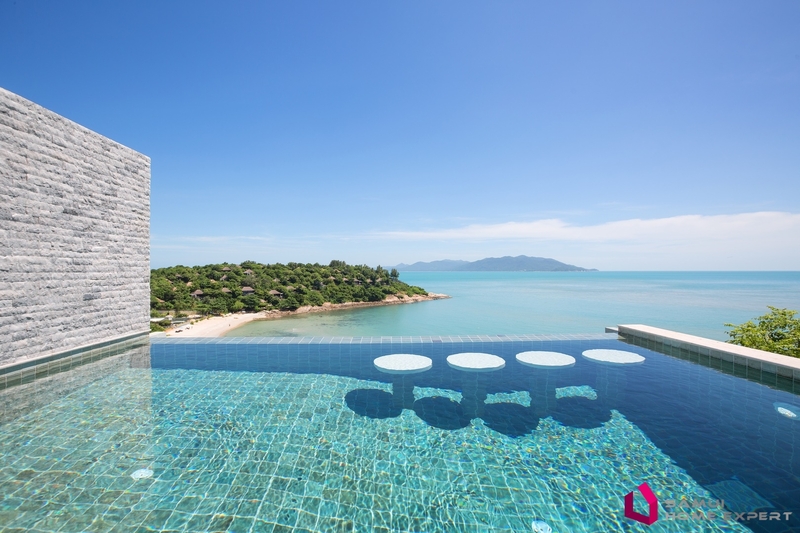 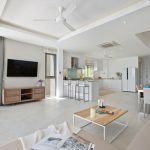 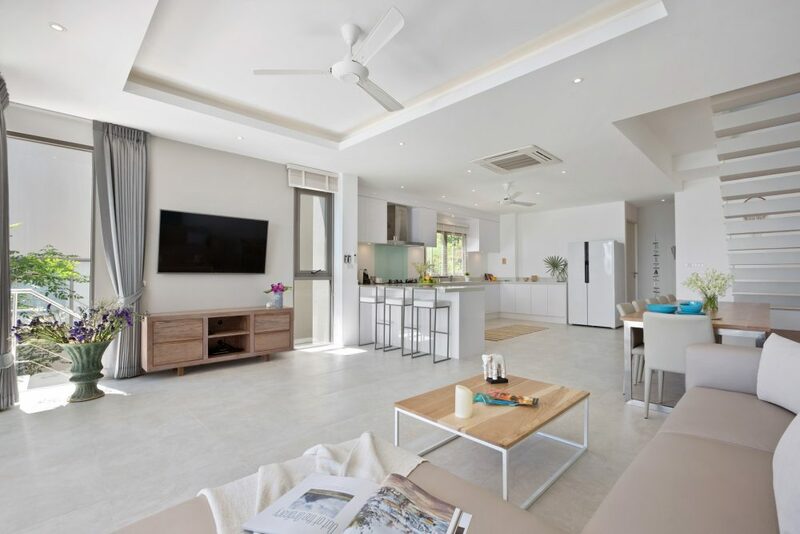 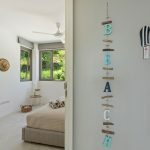 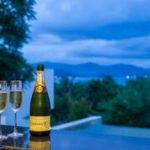 Exactly located on the prestigious Bay of Samrong, the northeastern tip of the island, the villa offers a real panoramic sea view and beach, and a view of the nearby island of Koh Phangan. 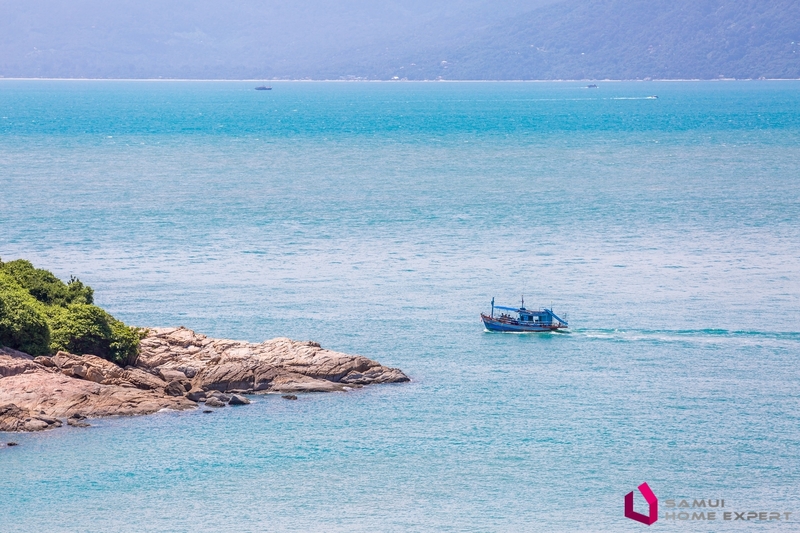 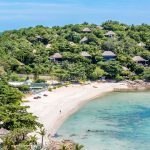 It takes only 5 minutes by car, scooter or taxi to get to the charming village of Choeng Mon, its large beach and its many Thai and international restaurants, shops and banks, 10 minutes from the fishing village of Fisherman, famous for its Friday market and 15 minutes to Chaweng and its famous nightlife. The villa of 5 rooms is declined on 3 levels, which allows an independence for each one. 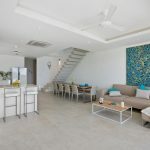 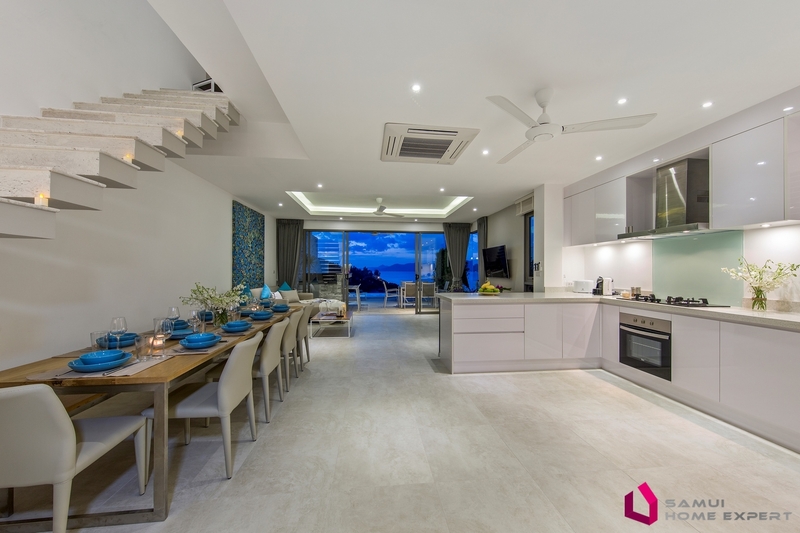 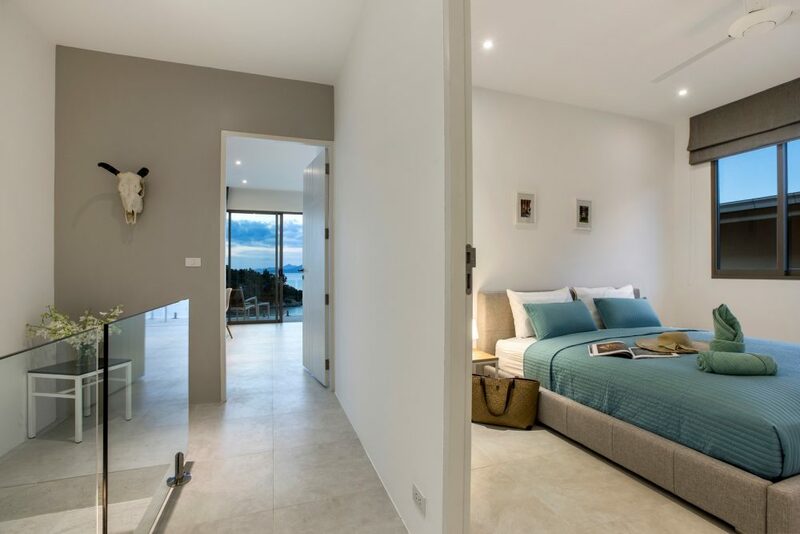 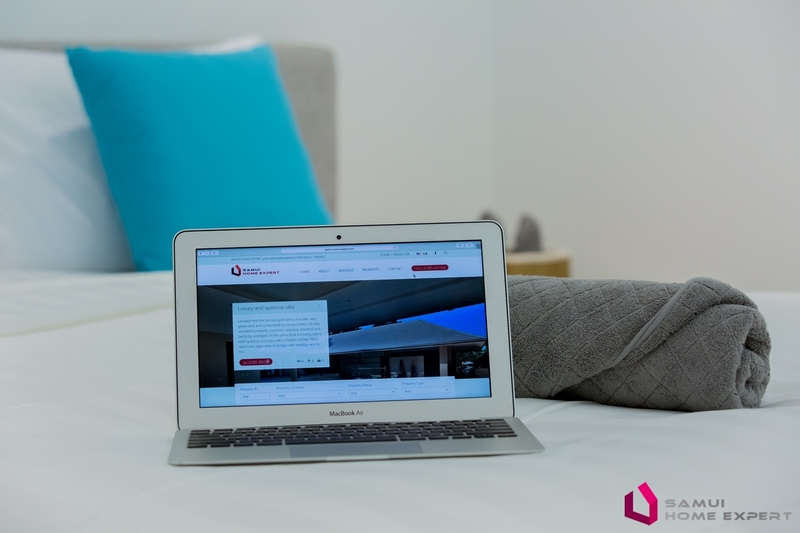 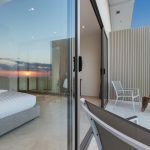 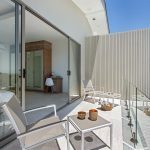 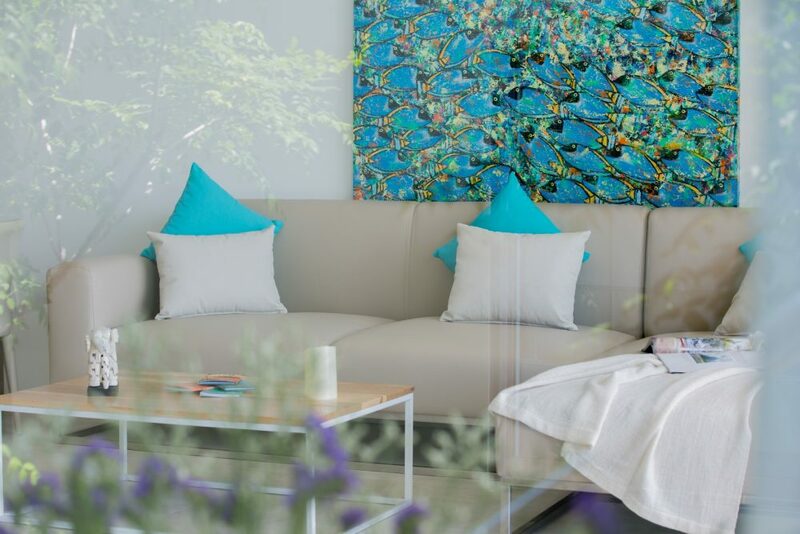 The ultra modern living room is facing the sea and is an open space with fitted and equipped kitchen, dining table for 10 people and a large sofa with flat screen and a box of 600 international channels and a multitude of films. 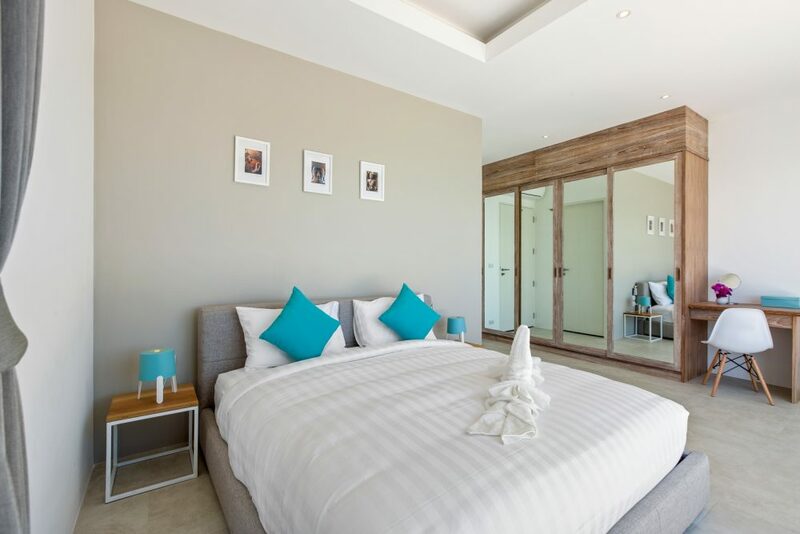 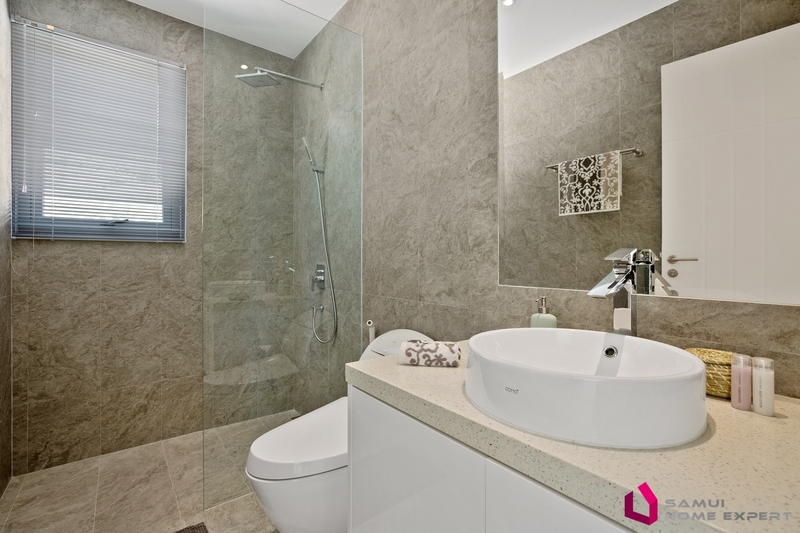 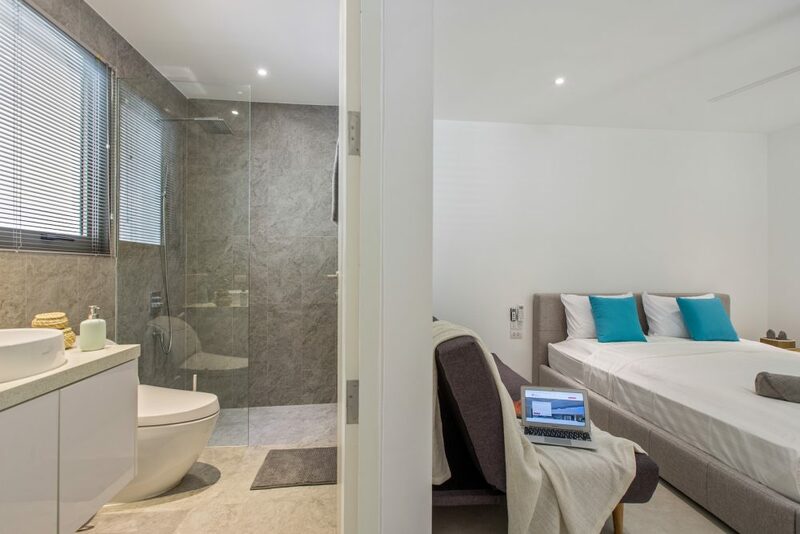 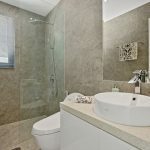 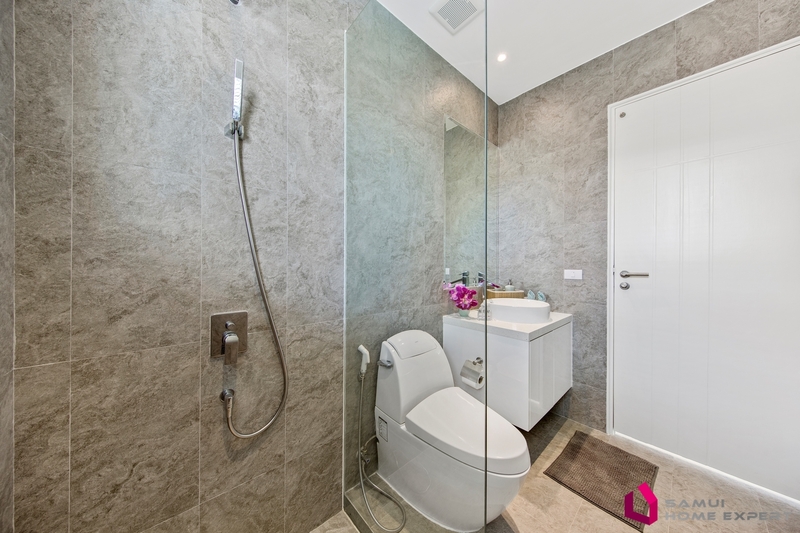 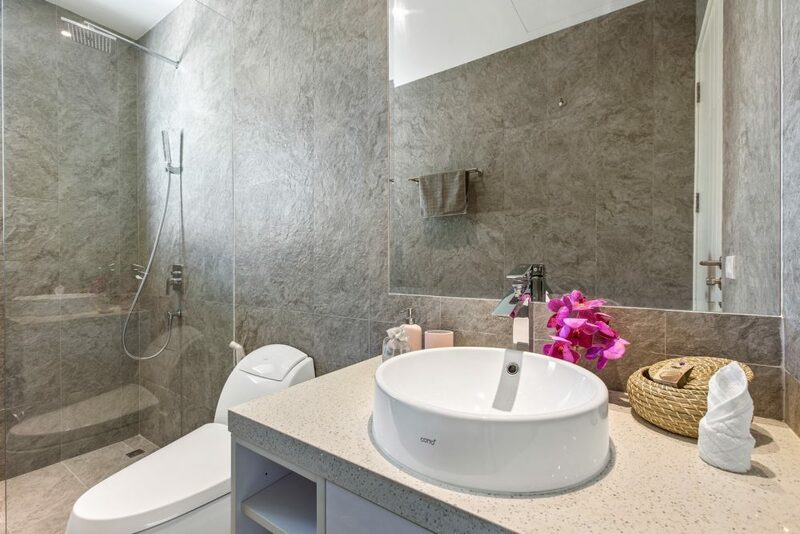 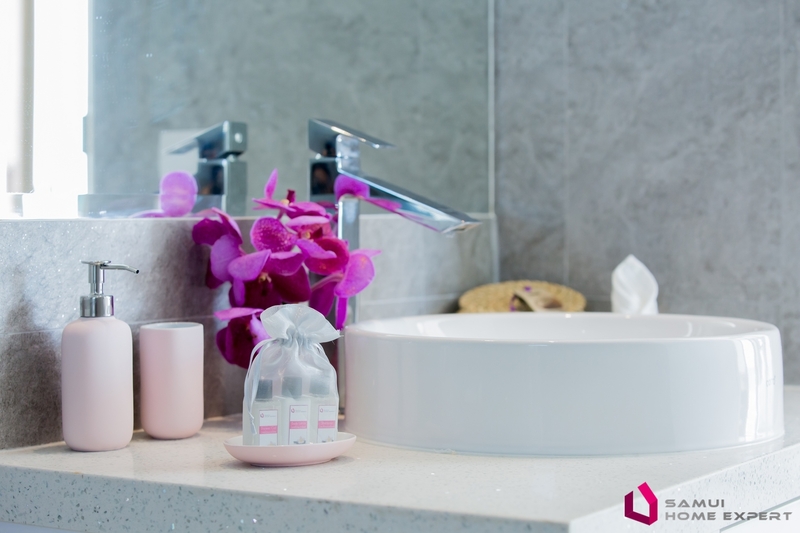 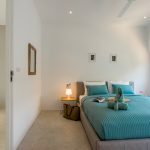 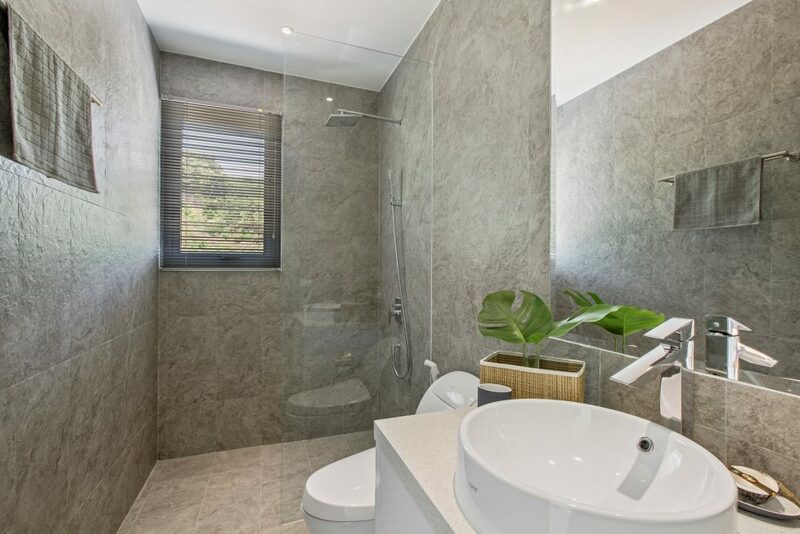 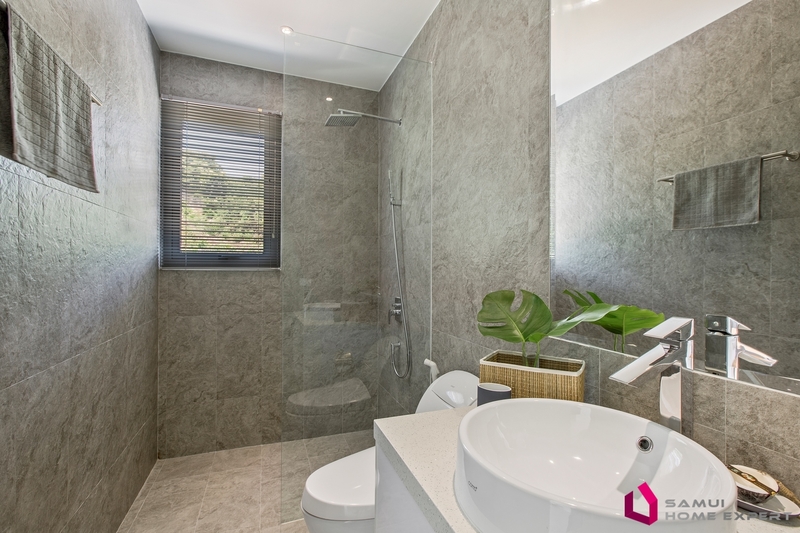 There is 1 bedroom with a king size bed and a modern bathroom. 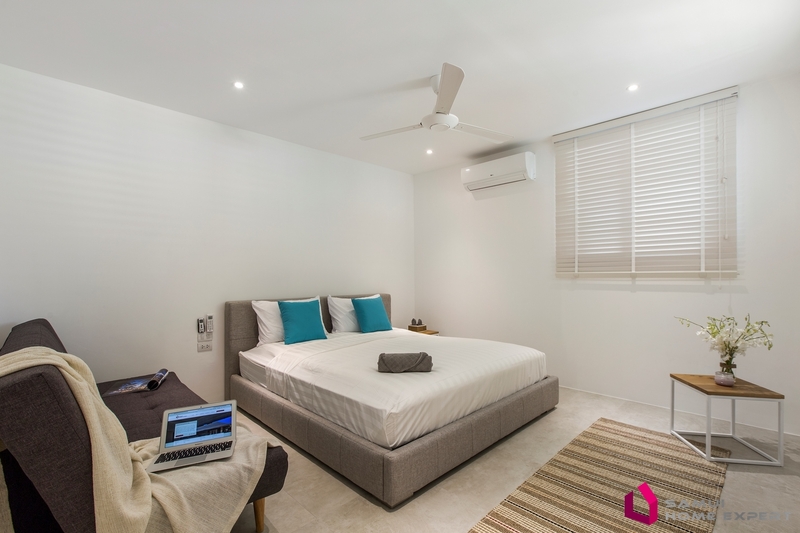 On the ground floor, 1 bedroom with bathroom, 1 king size bed and a sofa bed that can be used as extra bed, is ideal for teenagers. 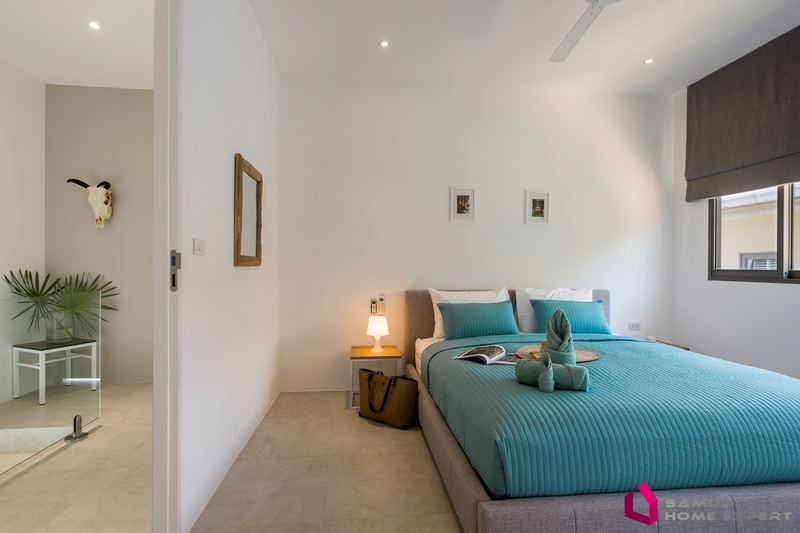 And upstairs, 3 bedrooms with all their bathroom and king size bed. 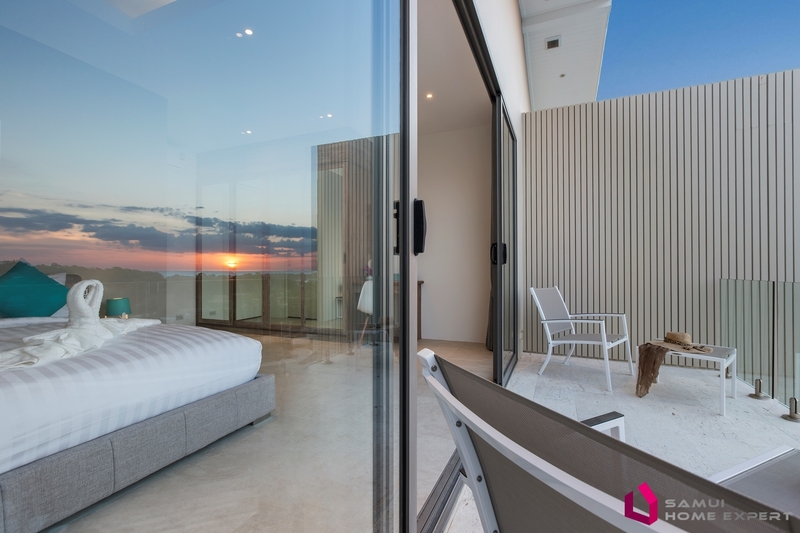 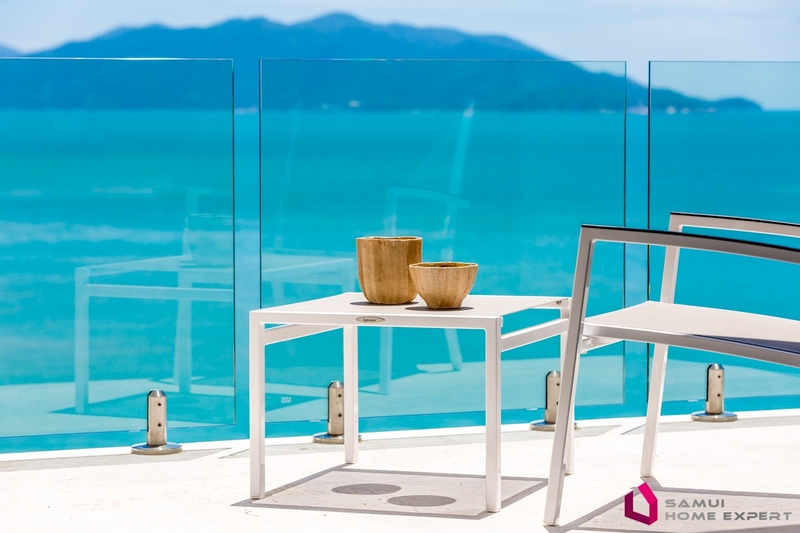 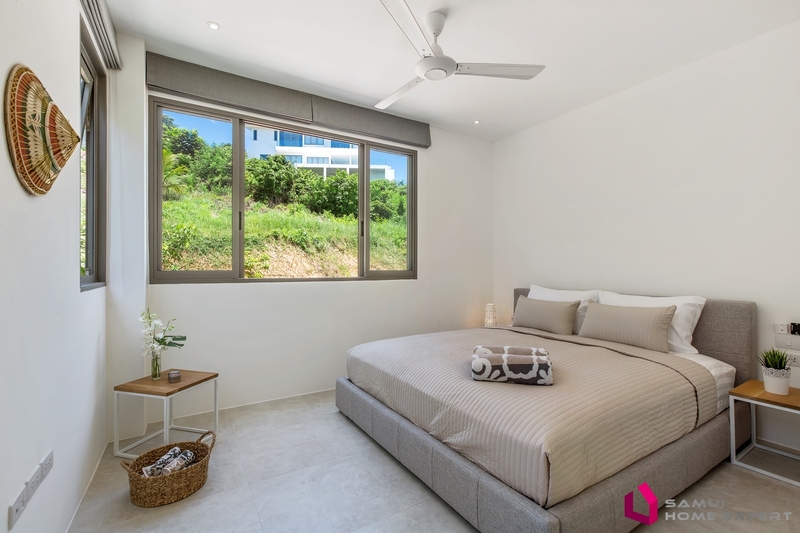 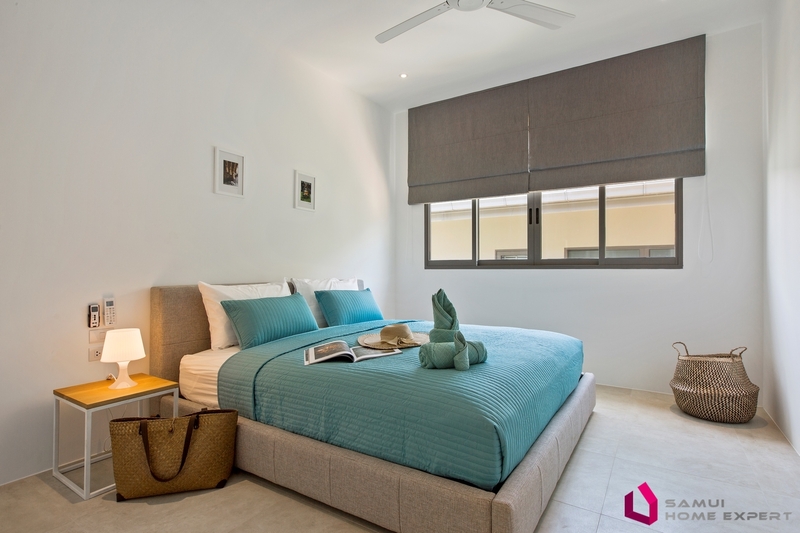 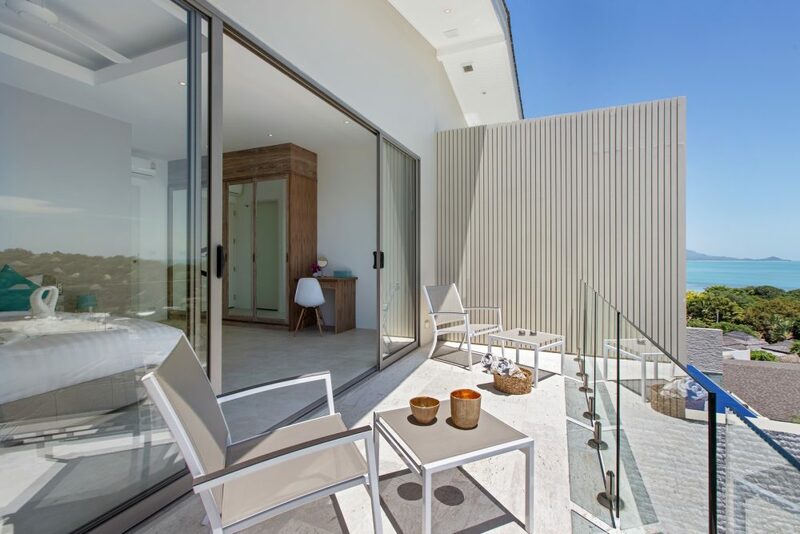 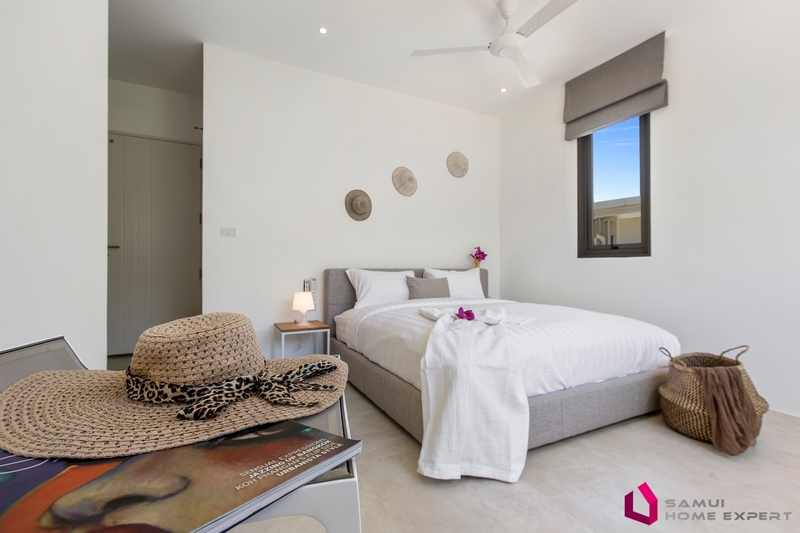 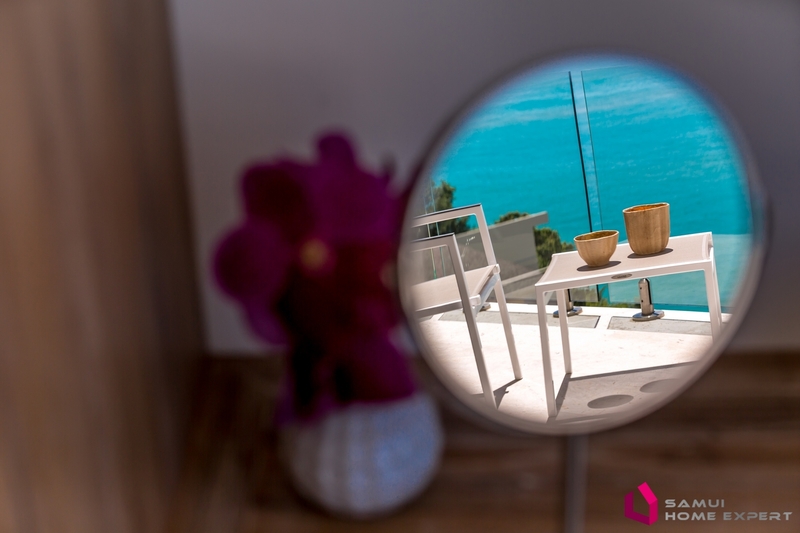 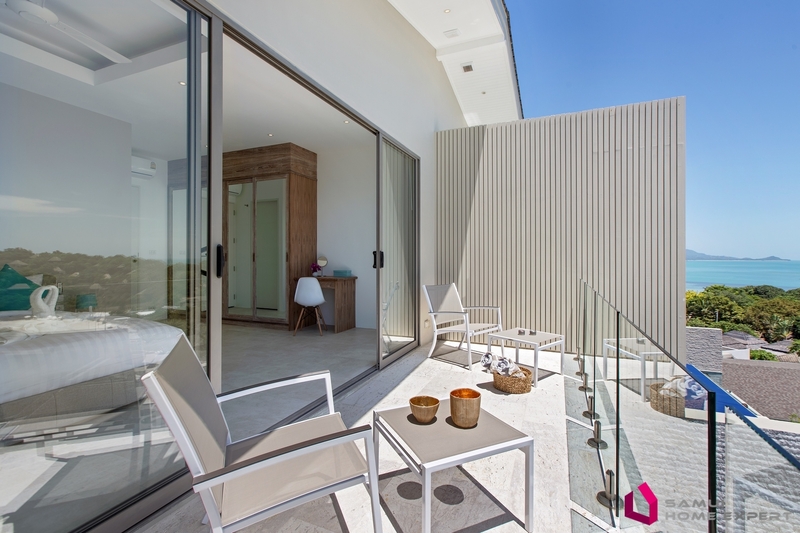 The private and cozy terrace of the master bedroom will offer you an idyllic sunset and a breathtaking sea view. 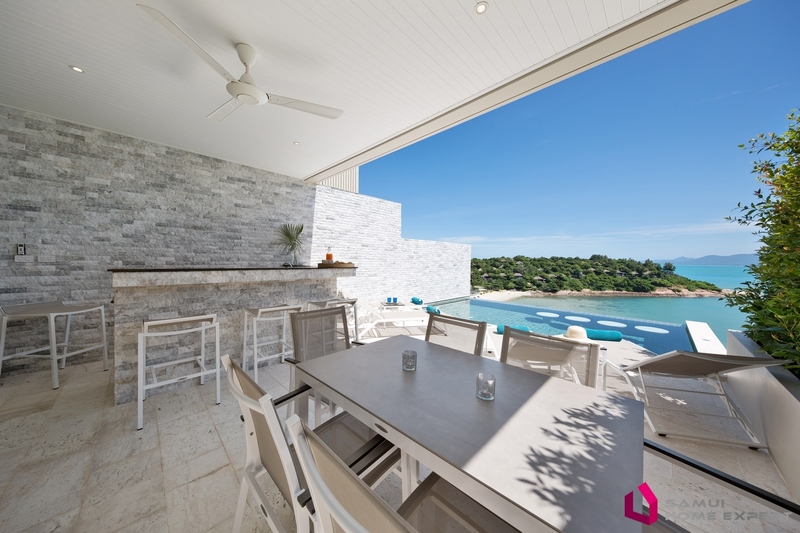 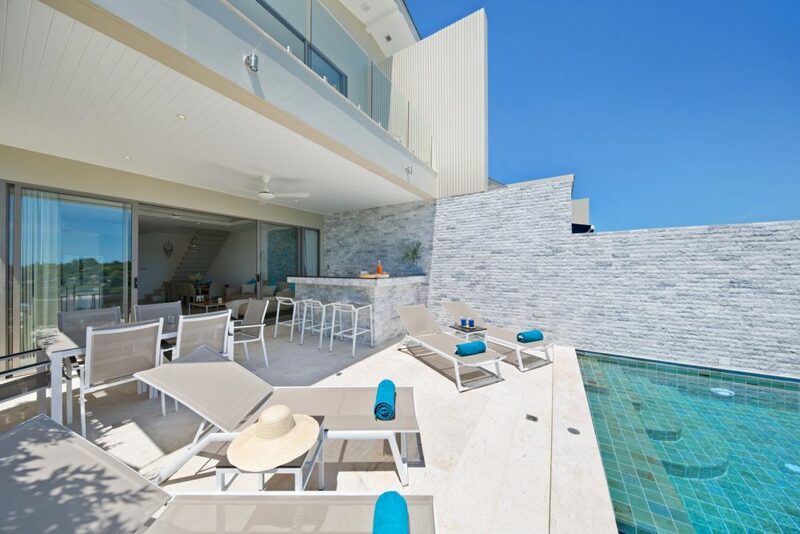 Finally, the terrace of the villa will delight you with its sunbathing, coffee table and diners, a spacious bar with small refrigerator and barbecue and its infinity pool with bali stones and bar stools directly in the pool to sip your cocktails peacefully. 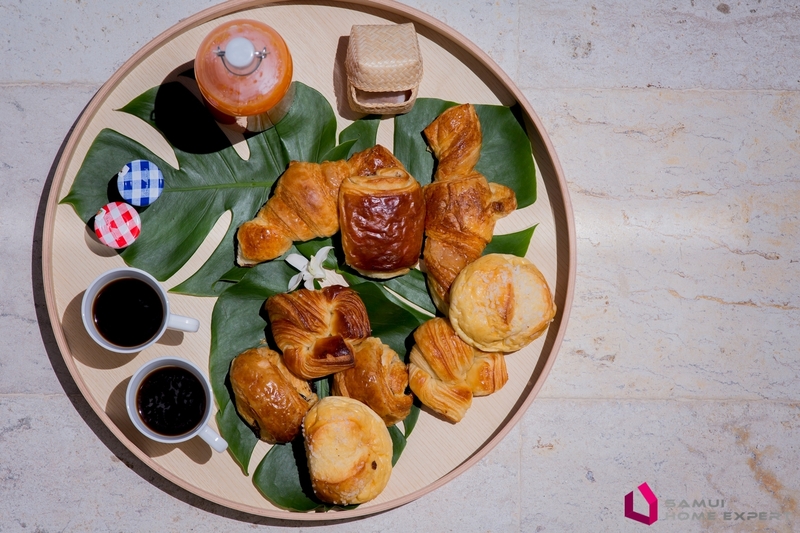 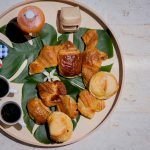 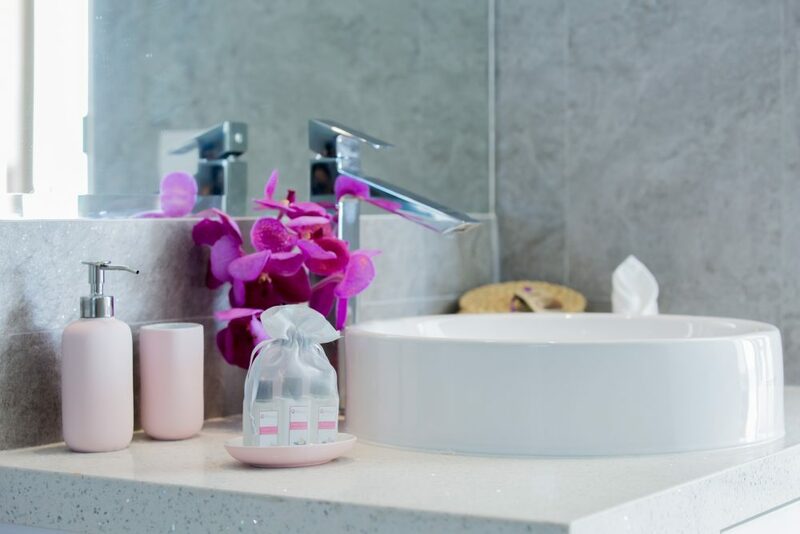 A continental breakfast is served each morning with fresh products from the island, as well as daily housekeeping. 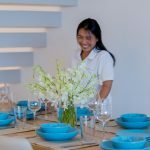 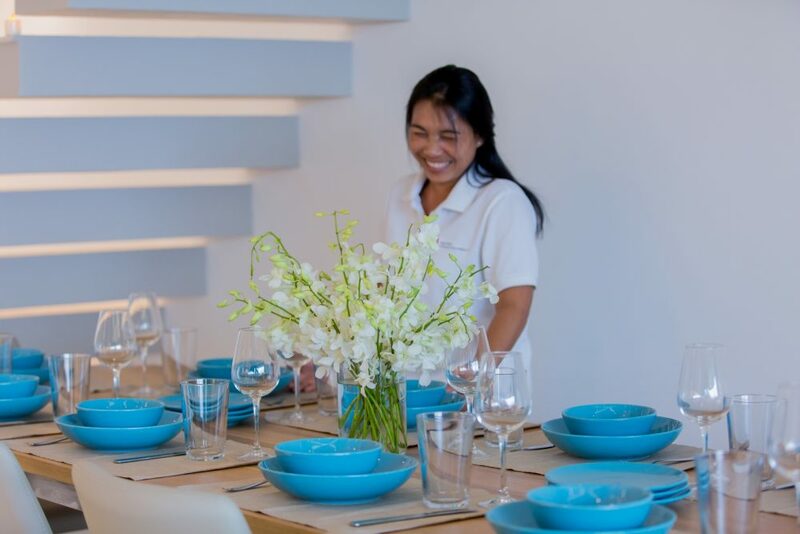 A menu in the villa of European and Thai meals is available for your lunches and diners and in just 20 minutes after order you will be delivered to the villa at competitive rates. It is also possible to organize a dinner with a Thai chef who will select the best products from the market. 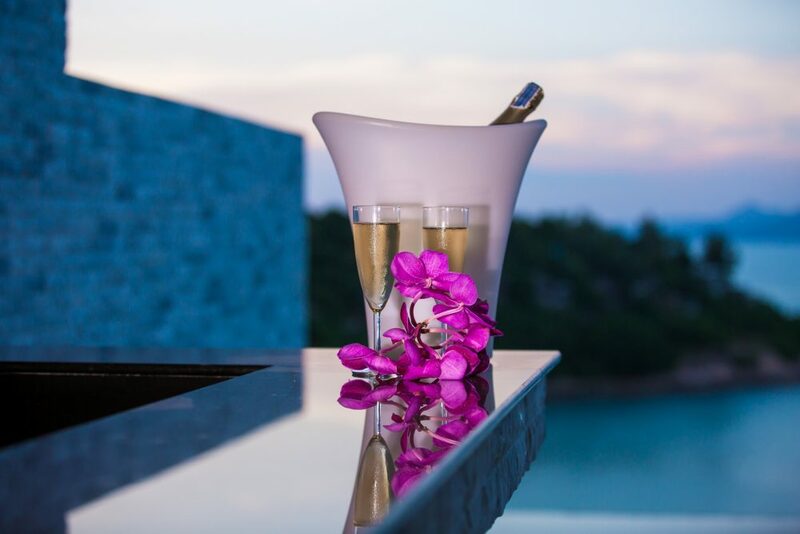 You can book an extraordinary restaurant, a few steps away, certainly one of the most romantic places to dine with spectacular views and surroundings. 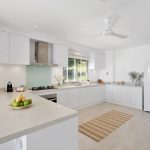 All the rooms of the villa are air-conditioned and have big fans. 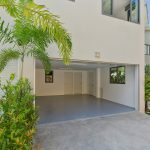 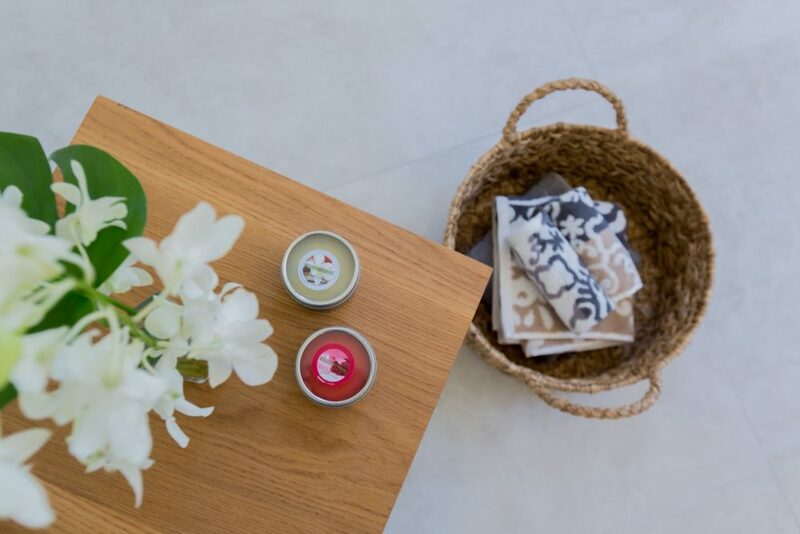 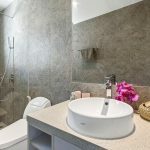 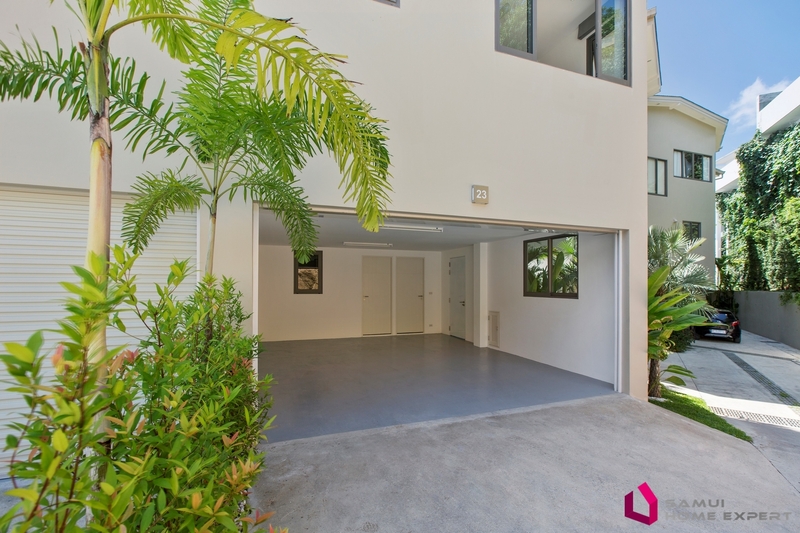 The villa is located in a secure residence with security man and has a closed parking space with automatic door. WIFI system with optical fiber. Rates according to season from 18000 THB.